Join us on Christmas Day for our service at the special time of 12pm-1pm at Knocknacarra National School. Join us at 2pm for a Christmas Day meal at Knocknacarra National School. Please bring something to share with everyone as well as plates and cutlery for yourself and your family. Join us on New Year's Day for our worship service at the special time of 12pm at Knocknacarra National School. Our Wednesday home group is currently meeting in Boleybeg at Jason and Mandy's home. We meet from 7:30 to 9:15ish. Up to holy week we'll be viewing some DVDs together called "Dispatches from the Front." They are a great look at some powerful things that God is doing in other parts of the world. Each week we'll be traveling somewhere different! It all ties in nicely with our Mission of God series that we've undertaken on Sundays. 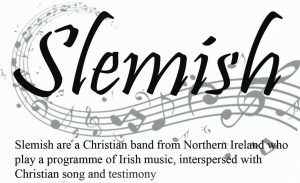 Slemish are a Christian band from Northern Ireland who play a programme of traditional Irish music interspersed with Christian song and testimony. The concert is free of charge and is organized by several of the Galway churches. It will be held on Saturday, February 18, at 8pm at the St. John the Apostle Knocknacarra National School. Bring your friends! Join us Tuesday, February 28, at 7:30pm in the school to hear from Craig Maiden. Craig is an Irish church planter currently serving with Baptist Missions down in Kinsale. Come hear Craig share his heart for areas in Ireland which still do not have Bible-teaching evangelical churches. It will be a great evening. Use the side entrance at the school (left side as you face the school) and come up the stairs to room 15. Join us at Gretta's for our Tuesday home group. We meet for prayer, Bible study, and fellowship over in Mervue (21 Loughnane Terrace). 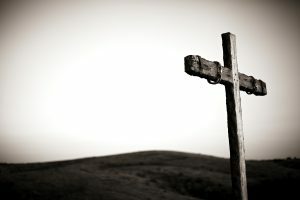 Join us as we reflect upon the crucifixion of our Savior, Jesus Christ. We'll meet promptly at 7 for some reading, reflection, and communion together. Please join us. Join us for breakfast at 9am Easter Sunday morning. If you are able to bring along something to share, that would be great. Please come anyway! Our worship service will begin at 11am. © 2019 Galway City Baptist Church. All Rights Reserved.